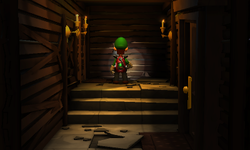 Under the Stairs is a secret room in Gloomy Manor in Luigi's Mansion: Dark Moon under the stairs of the Foyer. To access it, Luigi must use the Dark-Light Device in the middle of the left wall of the Patio. The room itself is nothing notable, although four gold spiders are present. There are two doors in this room: one that leads back to the Patio, and one that leads behind the aquarium in the Foyer, allowing Luigi to get an Amethyst. This page was last edited on May 23, 2017, at 13:00.